The British Empire & Foreign Countries auction held at Grosvenor’s Strand saleroom on 19th and 20th September, was a four session sale, the third of these over-running by a full 40 minutes due entirely to the intensity of the bidding, received pre-auction, by telephone and online on the day in competition with a strong attendance aroused by a presentation of Egypt that included much fine and rare material from the collection of Alan Jeyes and other specialists. 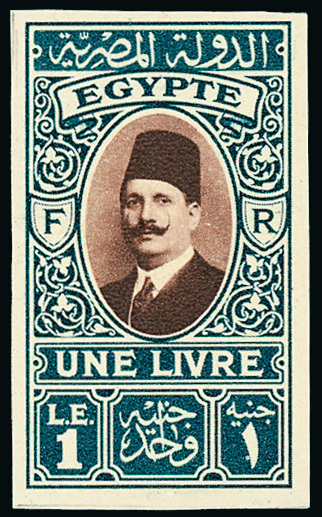 Prices for many lots left their estimates far behind, producing a string of notable results that included the £5,500 paid for an imperforate example of the 1927-37 Second King Fuad £E1 with “CANCELLED” on reverse (lot 1243, left) and £6,600 for a fine, comprehensive collection of this interesting issue (lot 1250). The greater part of the first day of this auction had been devoted to the stamps and postal history of Australasia and the Pacific Islands with offerings from a series of collections that will remain important for provenance long into the future. From the Malcolm Groom collection of Tasmania Pictorials the attractive hand-retouched photographic essay for the 5d. 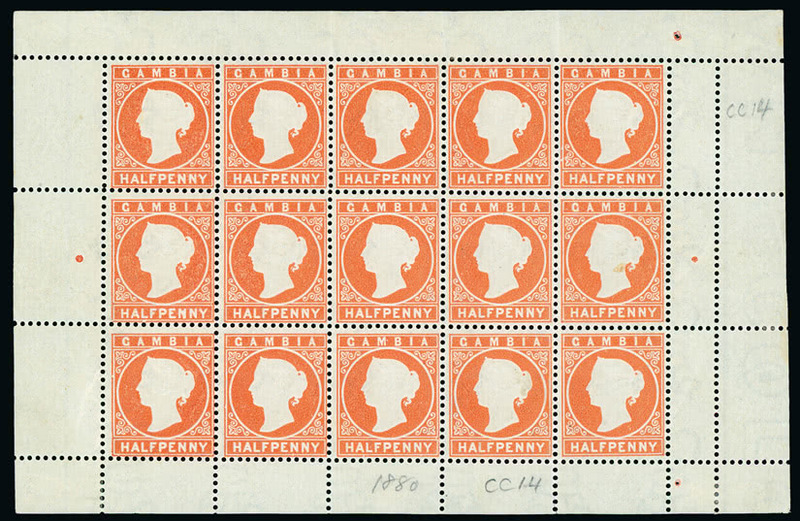 value (lot 187) was seen to reach £2,160 whilst the scarcity of the 1910 and 1911 2s. booklets (lot 279, S.G. SB3. SB4), was underlined by their £2,760 realisation, despite these being incomplete and with some faults. 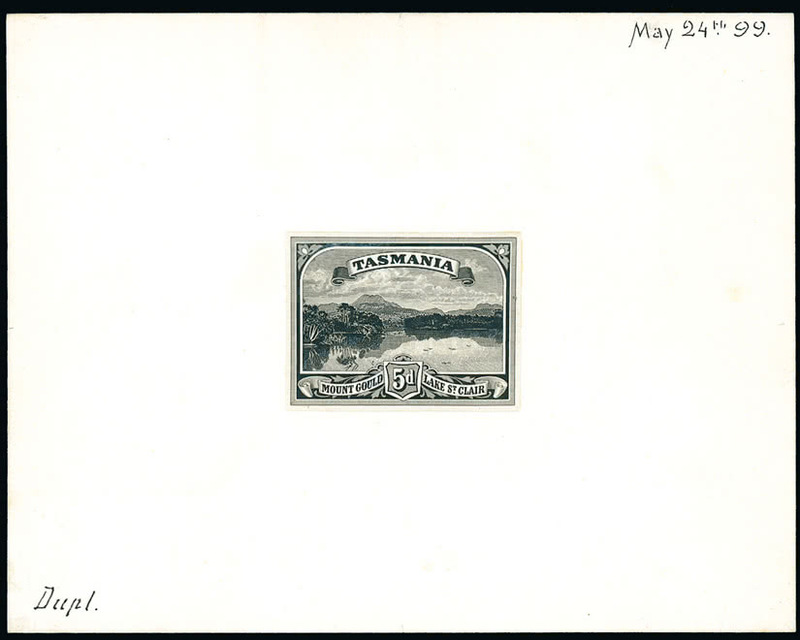 Among early covers from remote Pacific locations were a 1904 O.H.B.M.S. 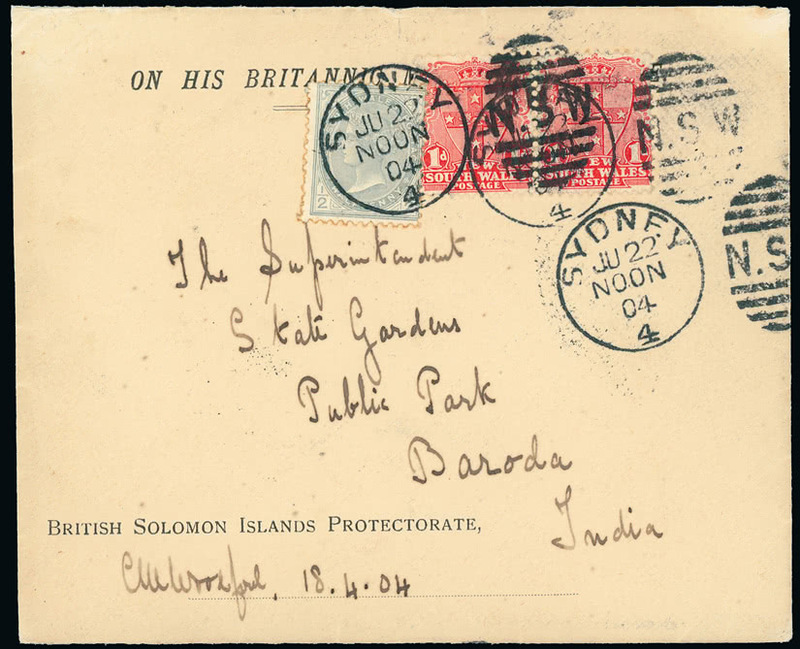 envelope from the British Solomon Islands with New South Wales ½d. and 1d. 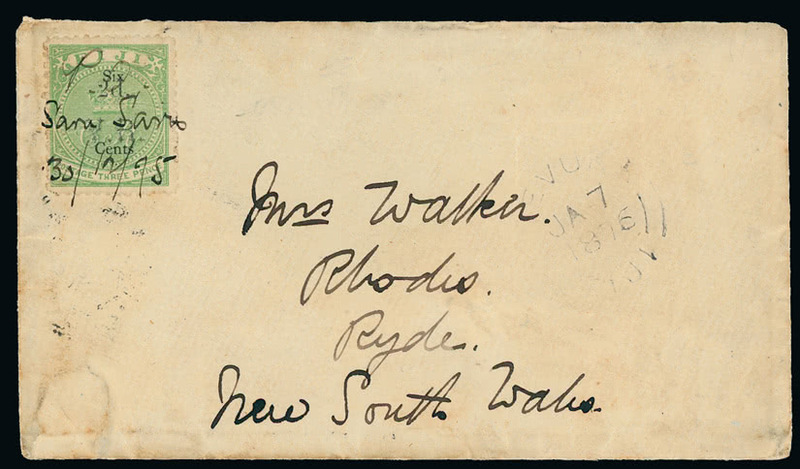 pair added in Sydney for onward transmission to India (lot 336, from the ‘Dickidido’ collection) that reached £3,000 and a rare example of the ‘Savu Savu’ manuscript cancellation on an 1875 cover from Fiji to New South Wales (lot 459, from the ‘Tuanjai’ collection) that achieved £3,720. The Jim Crompton collection of New Hebrides provided the front cover item for this sale, a strip of four of the 1908 1d. incorporating the rare overprint omitted variety (lot 745). This considerable rarity sold for £5,760. The also very scarce 1920-21 1d. on 5d. surcharge inverted variety (lot 779) reached £2,536. On the second day of the auction the response to the section of India lots was solid and enthusiastic, as is now expected, and there was also great interest in the Brian Davies collection of Gambia. The appealing small sheets of the Victorian Cameo issues retain their popularity, those of the 1880-81 ½d. 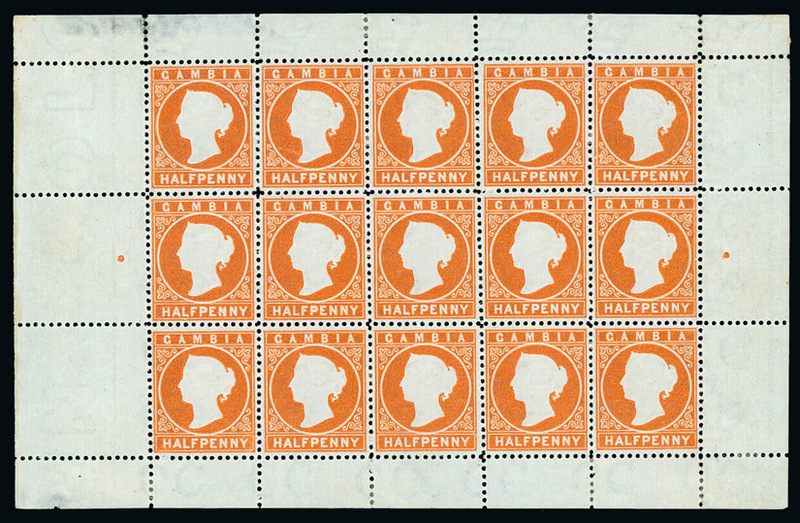 orange, second printing (lot 1431, S.G. 10B) selling on this occasion for £984, the third printing with watermark inverted (lot 1433, S.G. 11Bw) for £1,612. Highly regarded Indian States specialist, noted author of a number of important works on the subject, Raymond J. Benns was lost to the hobby prematurely in 1991 and his collection, untouched since, was offered intact in this sale (lot 1644). This provided the top price in the auction at £37,200. In a sale where many of the highest realisations were achieved by collections, other highly popular lots included the Early Picture Postcards of Siam (lot 2003), formed by the late Bryan ‘Dickie’ Dowler, which climbed to £13,200, and the Canadian Pre-Cancels (lot 1060), by Martin Cross, which rose inexorably to £19,840. Total realisation for this auction was £741,105, comfortably in excess of the pre-sale estimate. Full listings of prices realised at each auction may be downloaded from the Grosvenor website www.grosvenorauctions.com. Contact Andrew Williams or Tom Margalski at GROSVENOR for further information.